I know there are still some problems with all the Chapter Professionals receiving emails. We are working on a possible part of the problem. If you have not seen the previous post about saving the PGA email as a trusted sender please check out this post and see if it works. Central Washington Chapter – Not getting our emails? The 2019 Central Washington PGA Chapter Spring Meeting and Pro-Pro Championship will take place Monday March 25, 2019 at Zintel Creek Golf Club. The general meeting of the membership will be at 10:00am. A hosted lunch will follow around noon with the Pro-Pro following lunch. Remember, you must attend the meeting to play in the Pro-Pro. There is no entry fee for the event. Please signup online using the link below so we can get an accurate head count for the facility for lunch and for golf. Here is a great chance to attend a 2019 OGA Rules Workshop! As we all know the rules have changed pretty dramatically in the 2019 Rules of Golf. This is an opportunity in your Chapter to attend a workshop and get a really good grasp and understanding on all the changes. 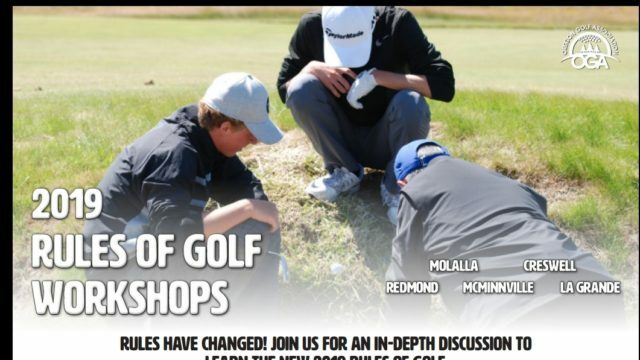 The workshop in your area will be in La Grande at La Grande Country Club on March 23, 2019. If you have any questions or need further information please use the information on the flyer below to contact the OGA.